Mostly visited for – Bhopal (capital of Madhya Pradesh and center of state’s power), Bhimbetka (over 600 rock shelters belonging to the Neolithic age), Sanchi (Buddhist stupa built by the Mauryan Emperor Ashoka), Pachamarhi (a verdant jewel of the Satpuras famous for waterfalls and cave shelters), Ujjain (the holy city dedicated to Lord Shiva and one of the sites of Kumbh Mela), Indore (commercial capital of Madhya Pradesh), Omkareshwar ( a sacred OM shaped island dedicated to Lord Shiva), Mandu (with the tales of the beautiful queen Roopmati and ruins), Gwalior (the dynastic seat of Scindias epitomizing rich culture with poets, musicians and saints), Khajuraho (temples with Kamsutra etched in stone), Shivpuri (gateway for Madhav National Park), Orchha (medieval legacy in palaces), Amarkantak (the origin of the scared river Narmada), Jabalpur (Marble rocks at Bhedaghat), Chanderi (center of fabric weaving), Datia (a Bundela treasure), Bandhavgarh – Pench – Kanha (tiger territories in the dense forests of Madhya Pradesh) Rafting, Cruise boats, House Boats, Jungle Camp and Water sports are the adventure sports that can be availed easily during Madhya Pradesh Tour. Major Cities – Bhopal, Indore, Jabalpur, Ujjain, Gwalior, Khajuraho, Mandu, Ujjain, Shivpuri, Panchmarhi and Orchha, etc. Weather - Summer: March to May, Monsoon: June to September, Winter: October to February. The climate of Madhya Pradesh is subtropical in nature making summers hot and winters mildly cold. 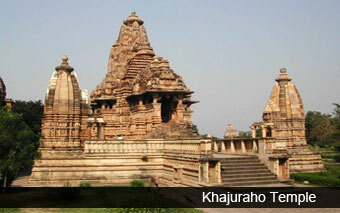 By Air - Gwalior, Khajuraho, Indore, Jabalpur and Bhopal, are major airports in Madhya Pradesh. By Rail - Bhopal is the main railway station in the state, which is served by important trains’ connecting it to the rest of the country. By Road - A strategic network of National highways and state highways interlink the cities of Madhya Pradesh to the other cities of India. Madhya Pradesh is the repository of rich culture, customs, traditions, history and way of Indian life. This region covered under this rich state is almost considered as old as the Indian subcontinent itself. The evidences at Bhimbetka rock shelters showcase the earliest traces of human life in India from the prehistoric times, inhabited by Homo erectus more than 100,000 years ago. 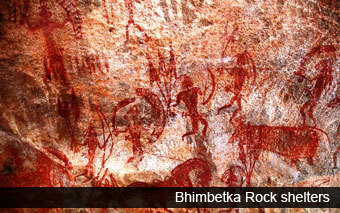 Some of the fascinating rock paintings here are believed to be 30,000 year old Paleolithic age. Isn’t it incredible? Yes it is. In fact, hundreds of such incredible Madhya Pradesh facets wait for the treasured tourists who experience the discovery of such secrets from the illustrious pages of history. One such glorious city in this centrally located state is Ujjain. This was an ancient seat of learning that rose to the status of the sacred spiritual center during the 6th century BC. Dedicated to Lord Shiva, this cultural capital of Avanti Mahajanapada was a home to Mahakaleshwar, a manifestation of the lord as Jyotirlinga. This central state also witnessed the scepter of Chandragupta Maurya’s stronghold around 320 BC. Later, Emperor Ashoka during the 3rd century BC in honour of Lord Buddha dedicated a small village in Raisen District, Sanchi for the cause of promoting Buddhism. The Great Stupa at Sanchi is the oldest stone structure in India, securing the relics of Lord Buddha. Besides this, there are many other Buddhist monuments in the complex, making it one of the important places of Buddhist pilgrimage. Towards the beginning of the medieval era, the region witnessed the rule of Chandela Rajputs who were very creative in their endeavours. One such standing testimony for Chandela kings is still present in Khajuraho as a World Heritage Site featuring Group of 25 temples, renowned for their carved excellence etched in stone. Later, the region became an epitome of glorious kingdoms of Gwalior, Bundelkhand and Mandu, Bhopal, Orchha, and Rewa. During the modern phase of India, Madhya Pradesh became a center of 1857 revolution under the aegis of Rani Lakshmibai and Tantya Tope. Nowadays, the state is unquestionably the heart of India, location wise and culture wise. Geographically, the state is tucked between Rajasthan from the northwest, Gujarat from the west, Uttar Pradesh from the northeast, Chhattisgarh from the east and Maharashtra from the south. This region is known for remarkable geography due to the presence of Vindhyas and Satpura range. The state is irrigated by the longest Narmada River flowing from west to east. This is often termed as the lifeline of Madhya Pradesh. The state is also characterized by its plateaus located in Malwa, Rewa, Bhandar and Bijawar-Panna region. The state is known for its rich and dense forests occupying nearly its 30 percent land share. The variety in tropical moist, tropical dry, tropical thorn and subtropical broadleaved hill forests lend diversity to the reserved forest region of this state. These forests form the backdrop for adventurers who want to experience the jungle book, full of colourful characters in these forests. The wildlife circuit features the must visit destinations including Bandhavgarh, Kanha and Pench (the inspiration behind Jungle Book), displaying the diverse flora and fauna together. Besides this, the region is blessed with mineral resources which can be noticed by the presence of the largest reserves of diamond and copper of India in MP. Also, the state is the marble mine of India, constantly generating this finest natural stone in the soft marble stone gorges. This is also the prime reason why tourists throng to the marble quarries of MP. Culturally, the state is a nucleus of India steeped in colours, customs and traditions. The reason behind this amalgam is the region’s deep rooted connection with the history of time. The most authentic specimen of rich and illustrated culture can be understood by visiting Bhimbedtka caves, which represent the remnants of prehistoric civilization in India. The various erstwhile kingdoms in the region also brings a tourist closer to the legendary culture painting a comprehensive picture of heritage and architecture altogether. Most of the growth in literature, ancient sciences and customs is dedicated to Madhya Pradesh. Here, the ancient literary epics like Abhijananashakuntalam and Meghdoot were penned down by Kalidasa. The two musical gems of medieval India, Tansen and Baiju Bawra were born here. Also, there are a number of folk festivals and dance forms that illustrate the rich culture of this national award winning state. Truly, this heart of Incredible India is full of overwhelming surprises. Endowed with rich and diverse forest resources, Madhya Pradesh is a flourishing wild destination preserving many exotic Indian animal species. A home to tiger, the national animal of India, the forests have ample varieties of other animals including elephants, antelopes, deers and bisons among the other attractive species. 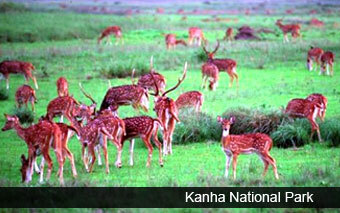 In all, there are Nine National Parks and Twenty Five Wildlife Sanctuaries dotting the tourist map of MP. Eat – The cuisine of Madhya Pradesh is influenced by the North Indian culinary art. The most prominently eaten food item here is Poha / flattened rice cooked with spices. The non vegetarians should head towards Madhya Pradesh’s capital, Bhopal in order to have a zingy taste of Korma, rizala, keema, ishtu, achar gosht (pickle like meat), roghan josh lamb curry and Kebabs. Saboodana (Pearl Sago), Kichdi, Bhutte ki Kees, Chakki ki Shaak, Kulfi and Date Palm, Toddy, Bhopali Paan, Mawa-bati, Shreekhand, Khoprapak, Malpua, Bafla (Wheat Cakes) are other culinary delights of this rich state. Hotels – Hospitality in Madhya Pradesh is followed in adherence to the tradition of the state. Here, tourists can enjoy the hospitality from the numerous options available in heritage hotels, five star hotels and inside the recently launched super deluxe vehicle on which caravan tourism can be carried out effectively.